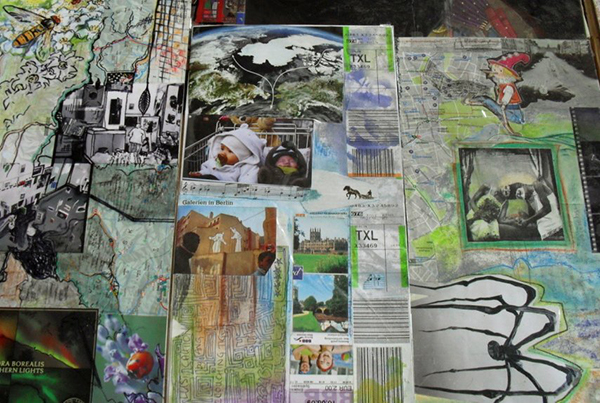 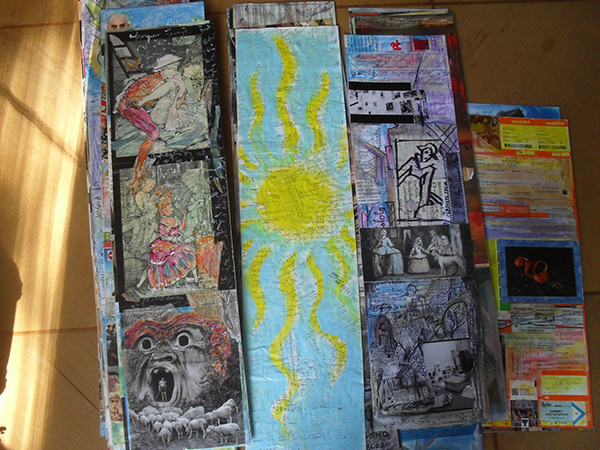 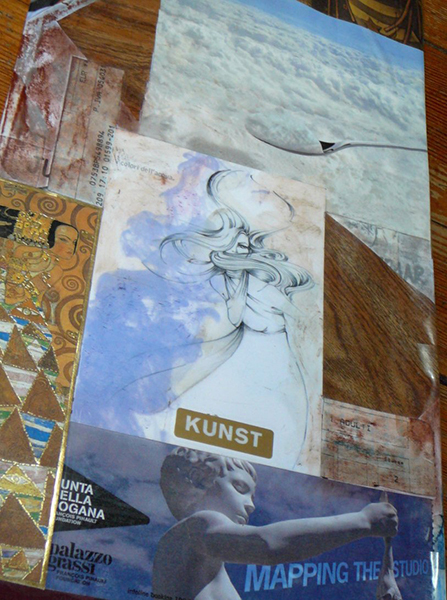 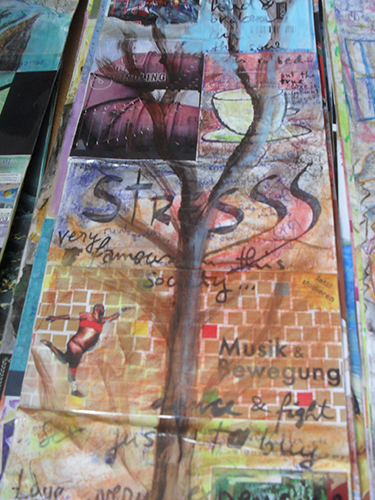 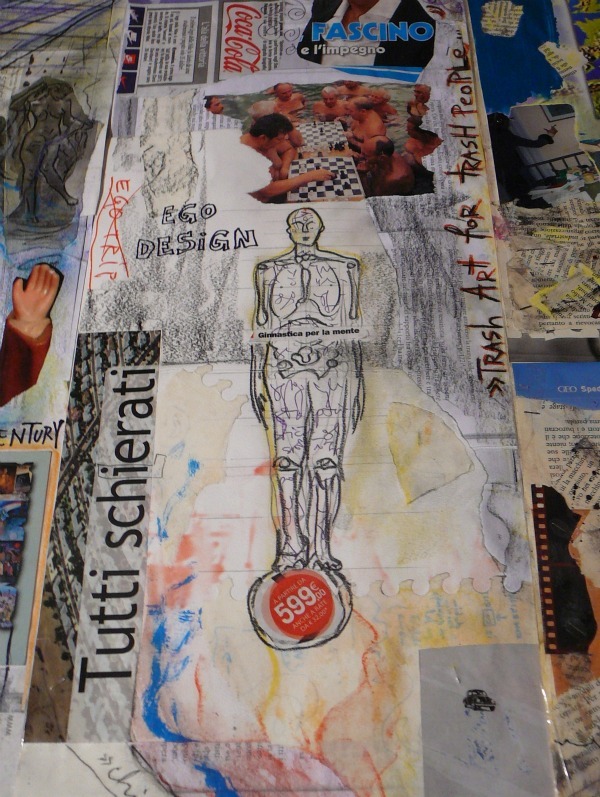 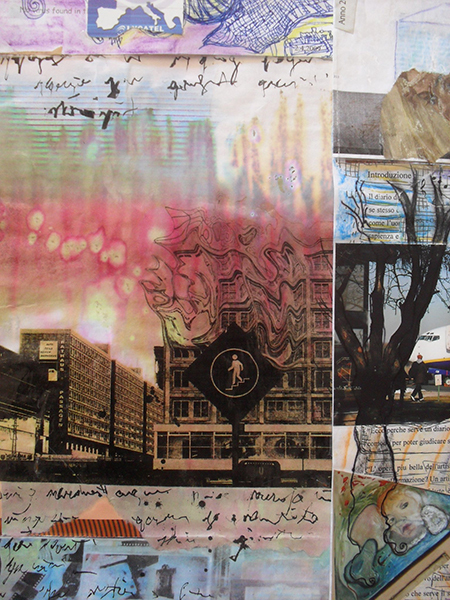 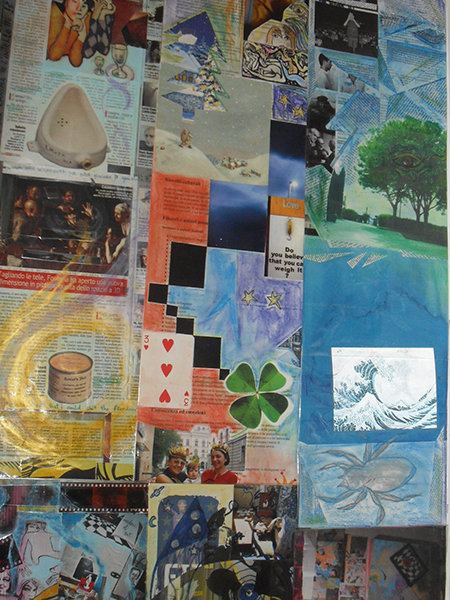 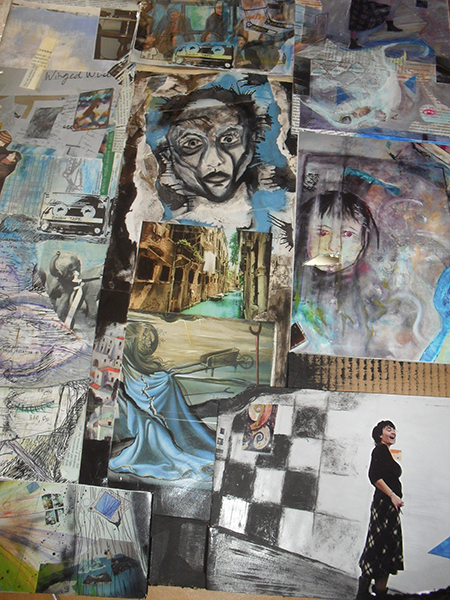 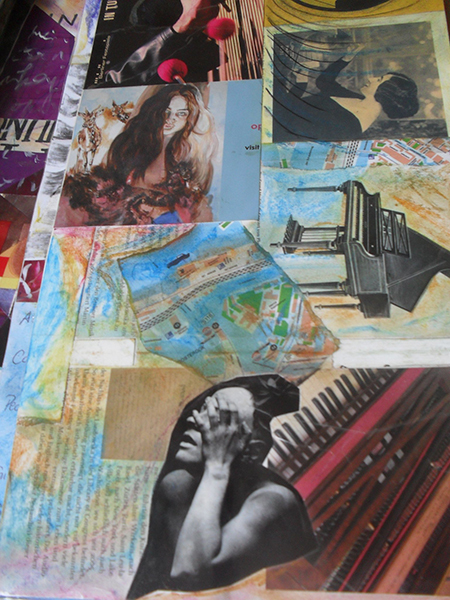 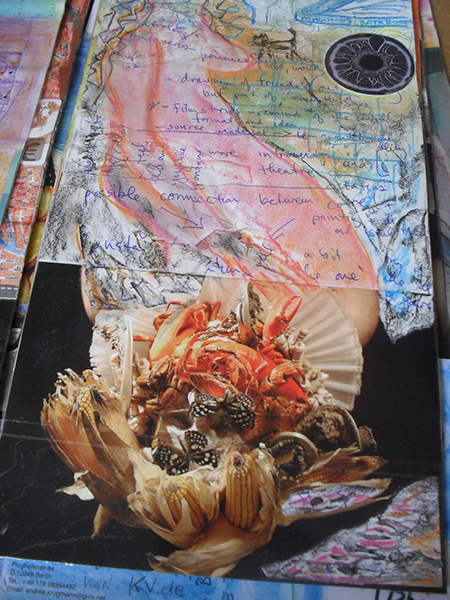 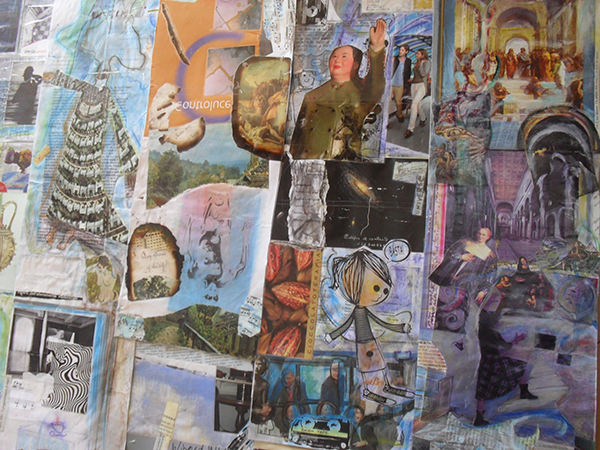 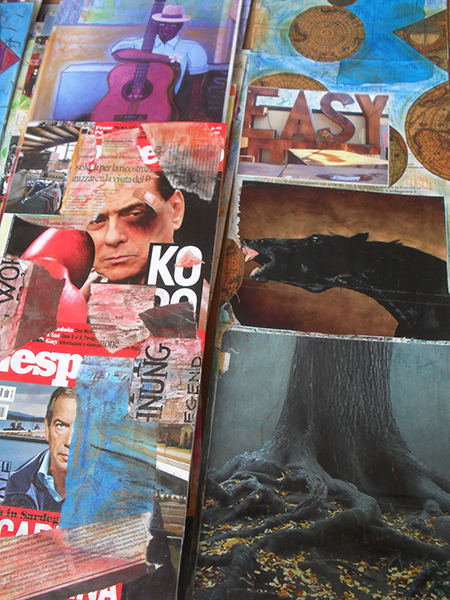 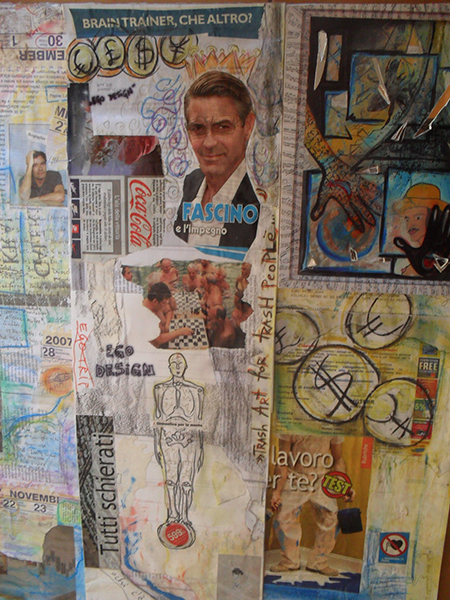 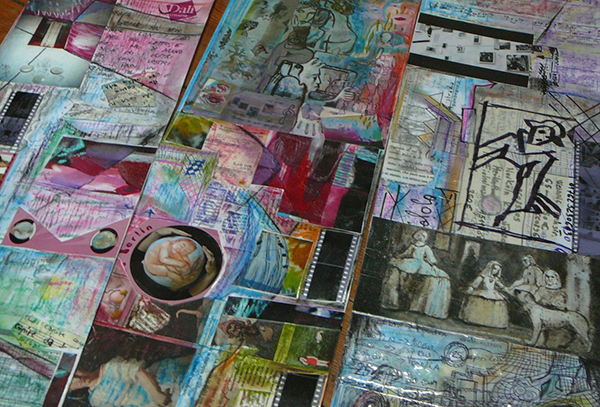 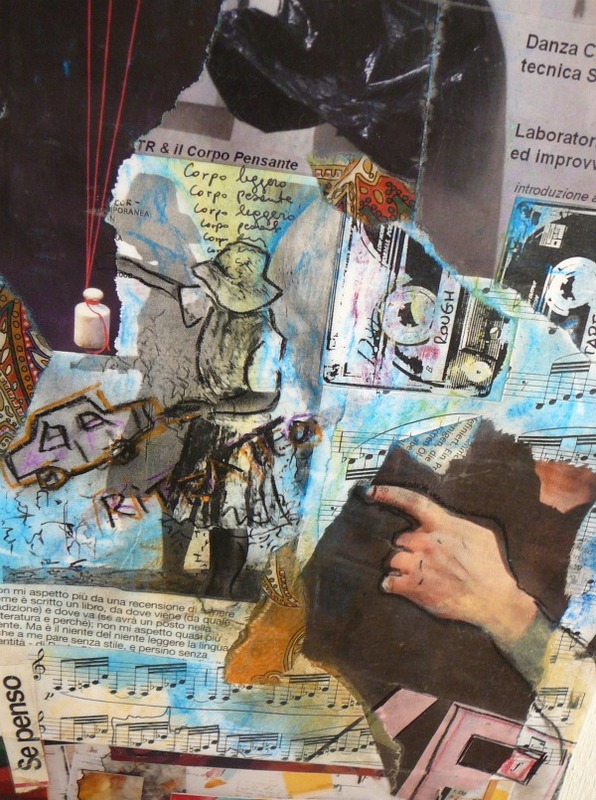 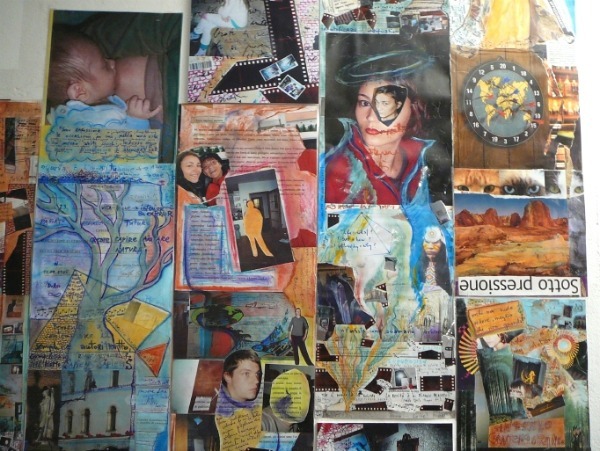 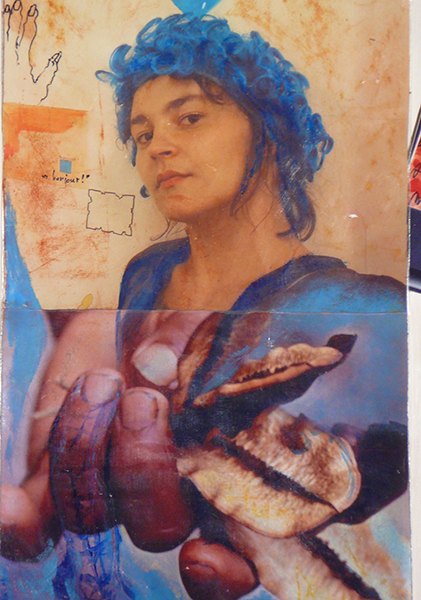 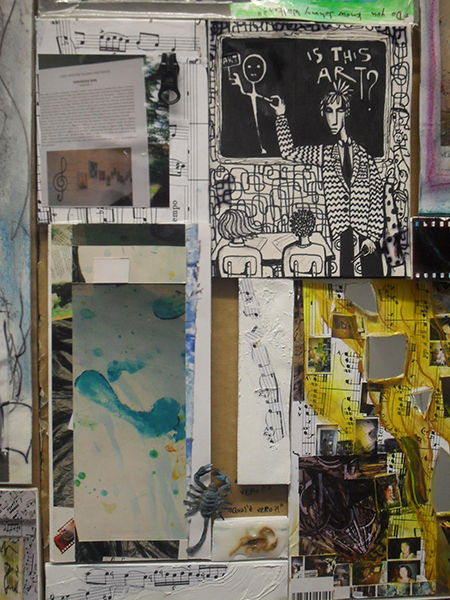 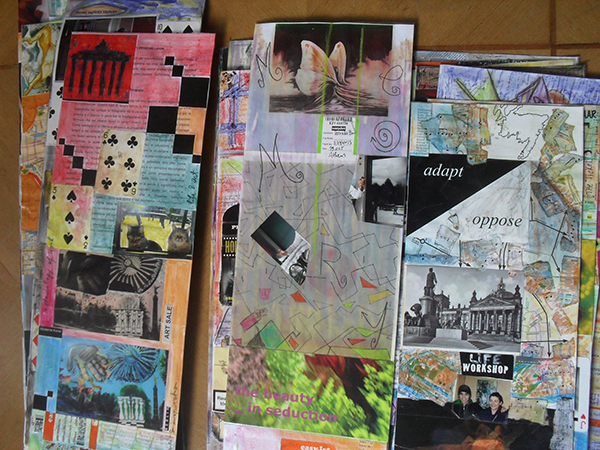 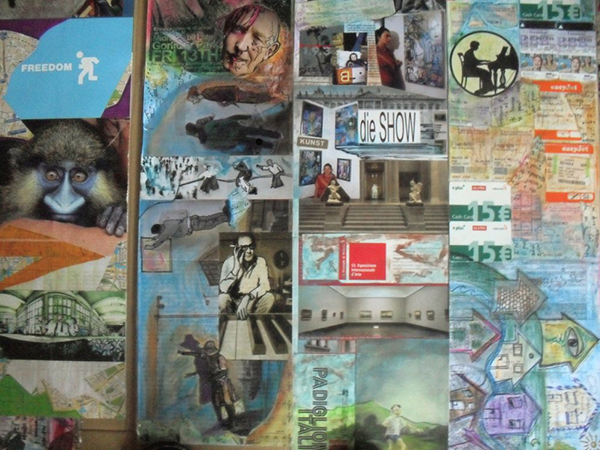 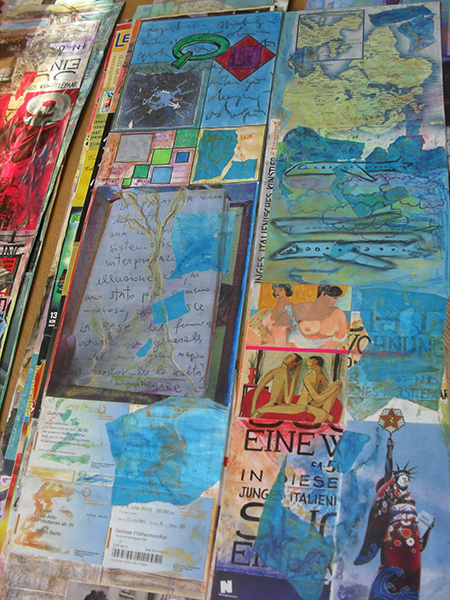 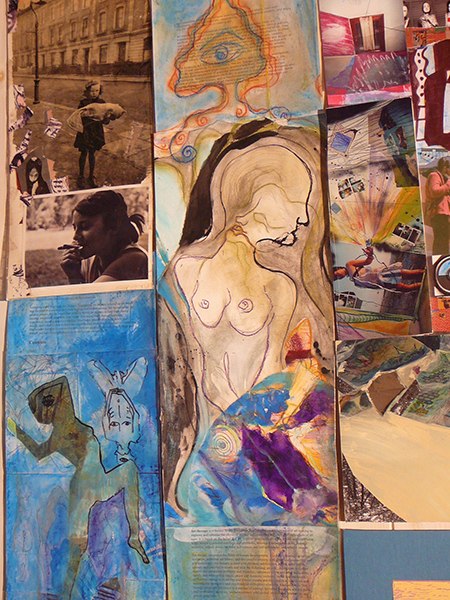 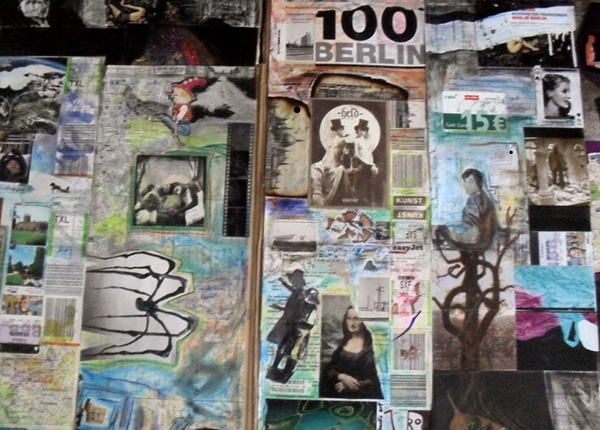 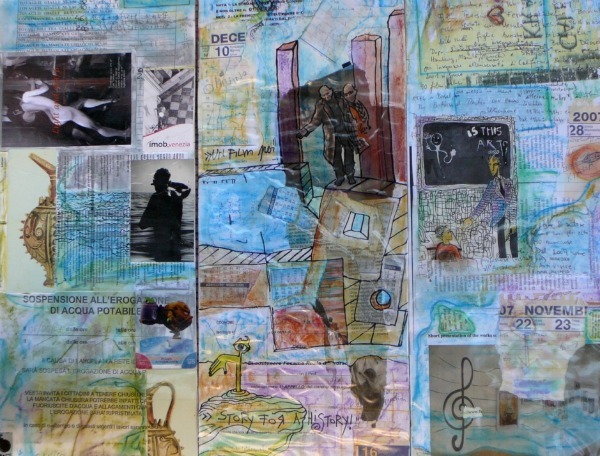 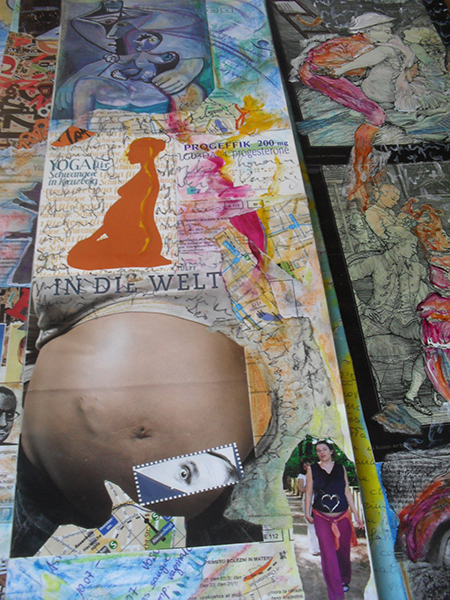 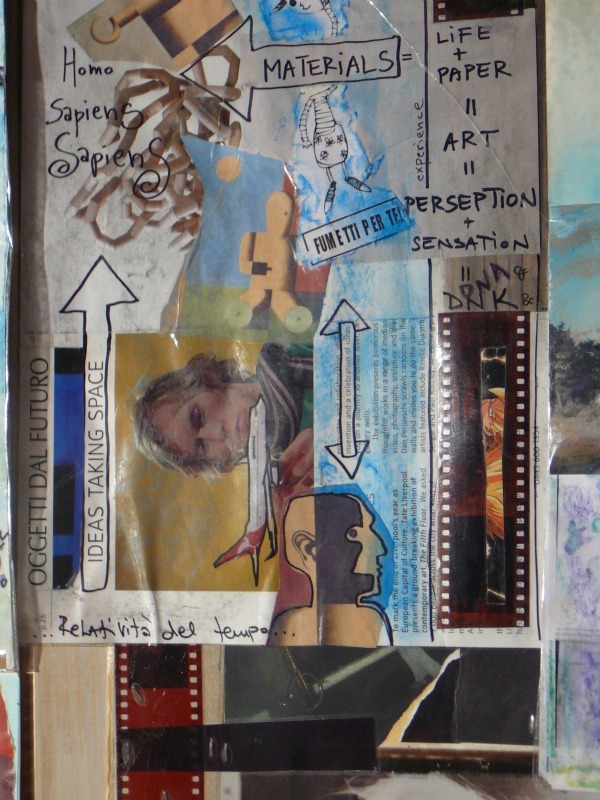 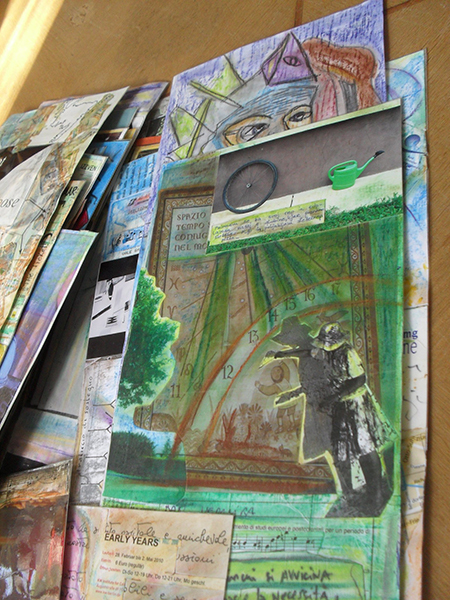 The theme and materials used before in Art Diaries from 2000 to 2005, have continued to appear in a new form of art story named Long Collages. 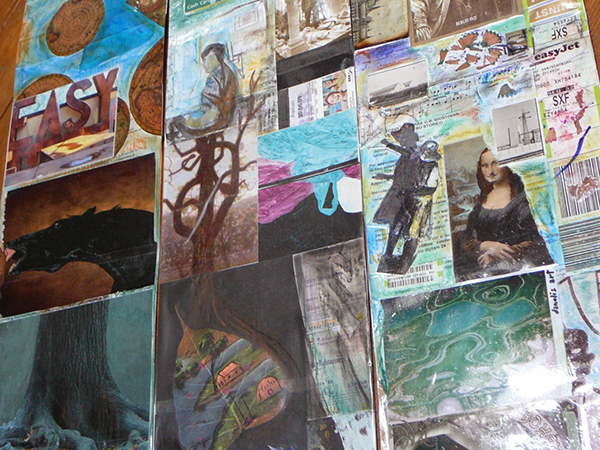 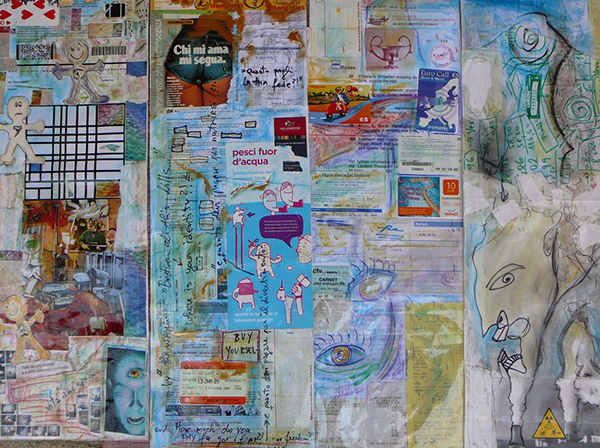 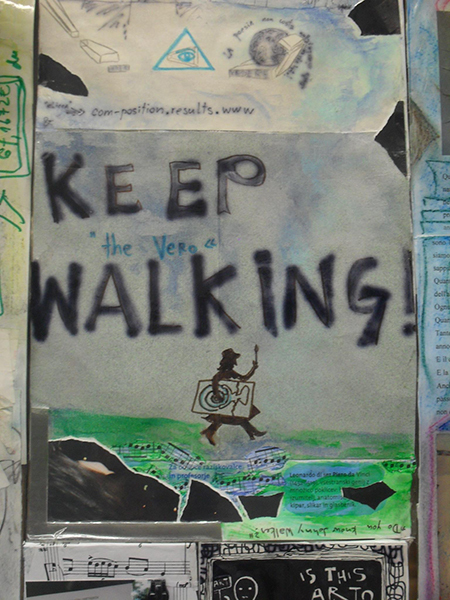 The idea of Long Collages was born in Venice in 2005 with a view to make the longest collage in the world. 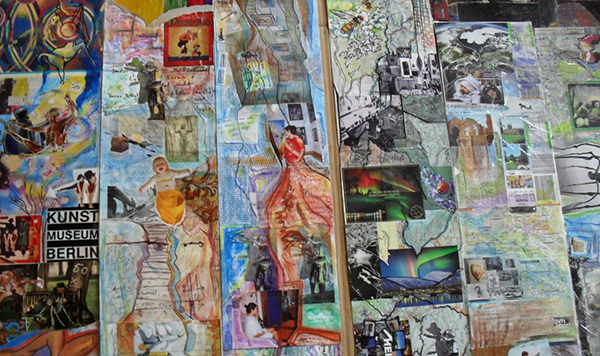 The longest collage with its form and dimension, with its contents and intention, would represent the idea of film about life, about living society. 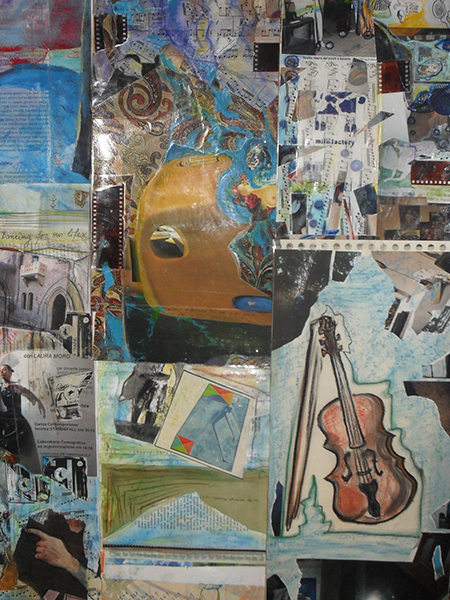 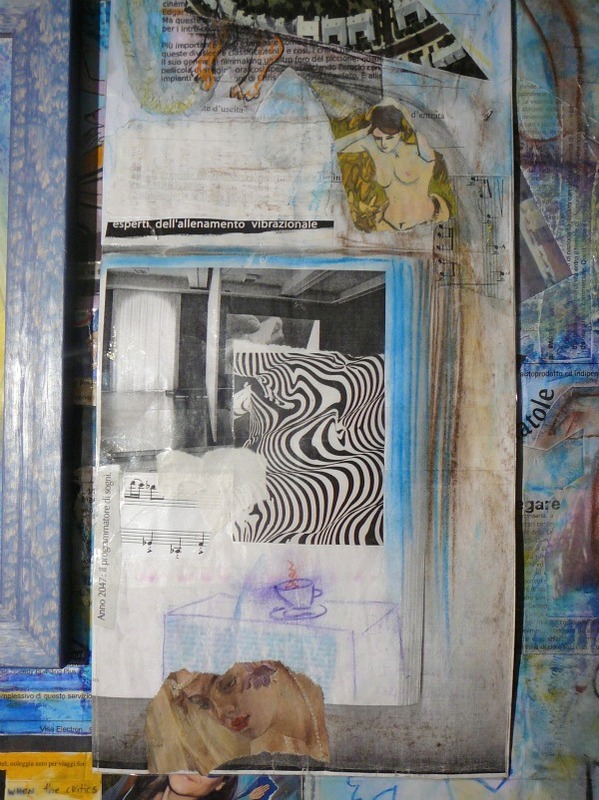 The items that these collages are composed of are mainly items that were found spontaneously and not searched for. 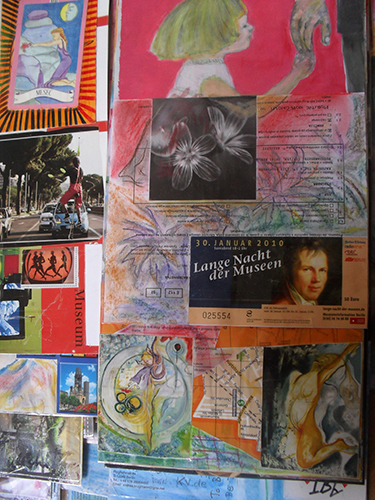 Images, pieces of newspapers, photography, tickets, fliers, postcards, geographic maps, poetry and stories, drawings, music notes and other items that we find in this collages, were collected from everyday life and then glued on paper and manipulated with acrylic colors, oil crayons or dry pastel colors. 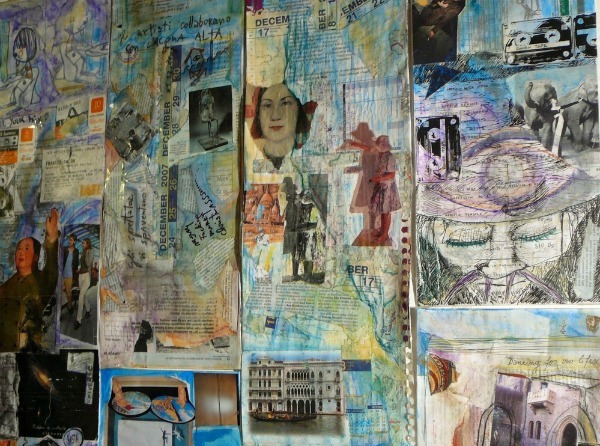 This reflects real life where we live situations spontaneously and then elaborate them with our mind and emotions in our memory. 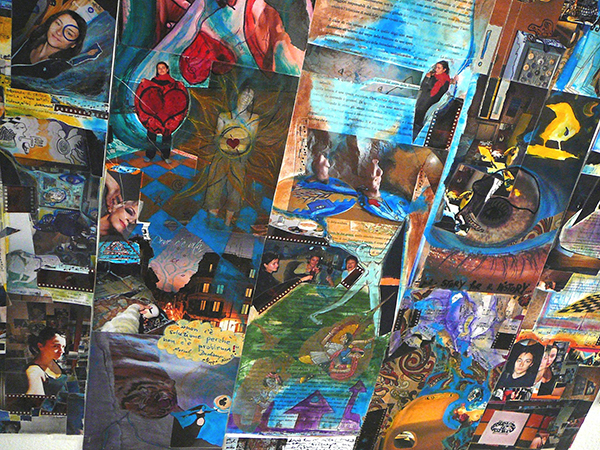 When one long piece of collage is complete, I cover it with a transparent self-adhesive plastic. 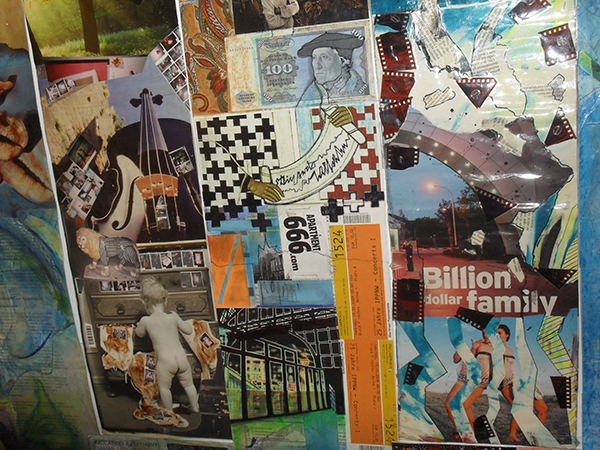 Thus, collage hidden behind plastic gets greater similarity to the film. 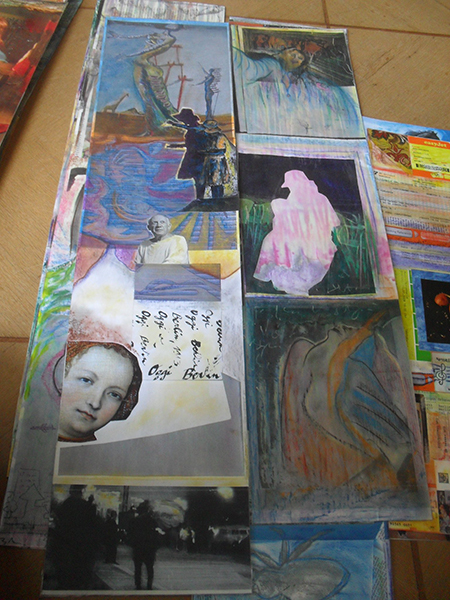 The width of Long Collages is 20cm while their length is spontaneously determined. 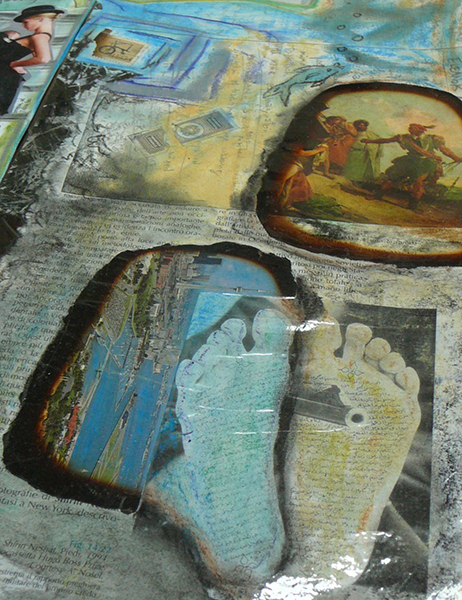 In the beginning they were in 3m pieces, which later became around 1m for easier transport. 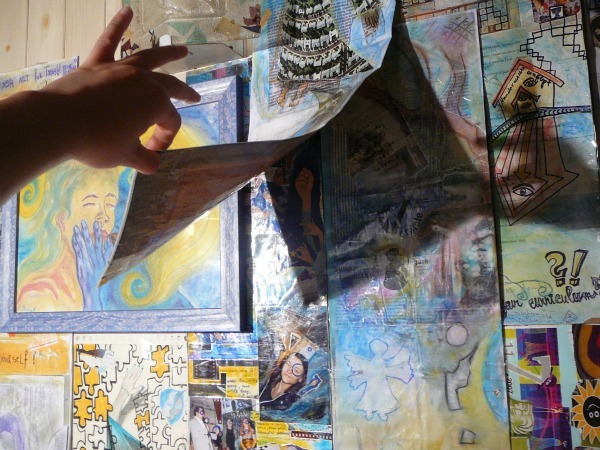 However when these pieces are exhibited, they usually fill the exhibition space, losing the idea of one piece presented by itself, but they form together a single piece of art. 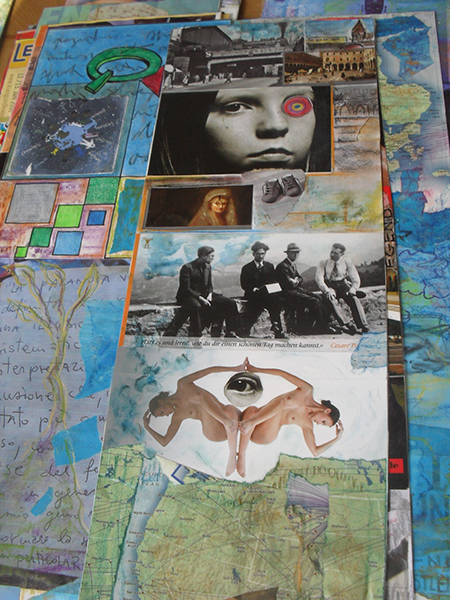 To date, some 400m of these collages have been created. 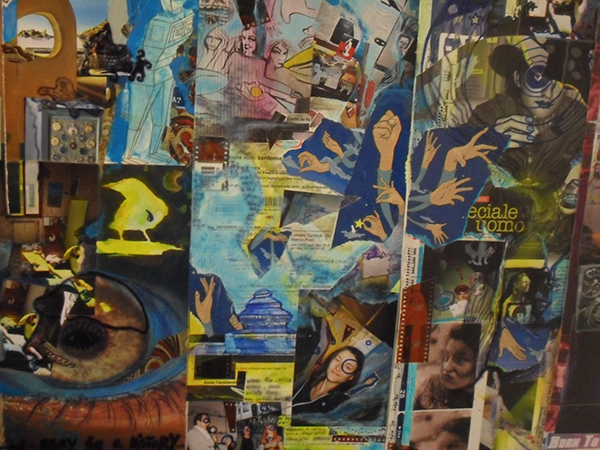 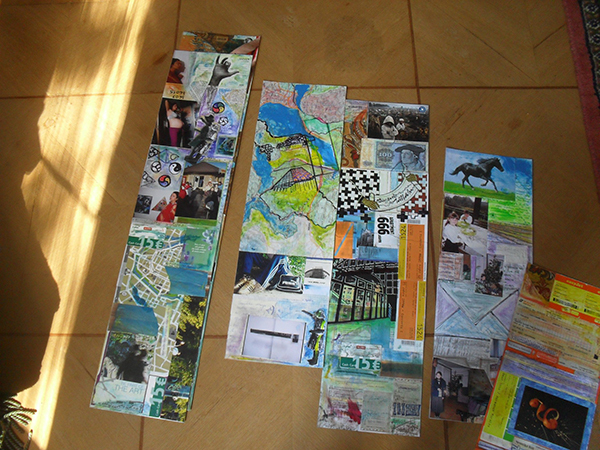 Project is still in progress, as the idea is to reach one kilometer of Long Collages.